A haunting study, both scholarly and personal, that situates the practice of confession as the source of the Catholic Church’s clerical abuse. In this deep-reaching history that also encompasses the voices of the deeply scarred, provocative English historian, memoirist and novelist Cornwell (Fellow/Jesus Coll., Cambridge; Newman's Unquiet Grave: The Reluctant Saint, 2010, etc.) 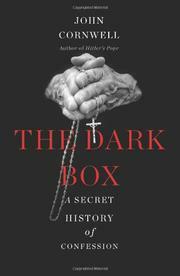 focuses on Pius X’s lowering of the age of first confession from 13 to age 7 from 1910 onward as the spur to the church’s worst sexual abuses. The discrepancy between Catholic teaching and practice has dogged the church for centuries, and confession evolved from a way to reconcile penitent sinners back into the fold into an outlet for the severe repression of priests. A form of “repetitive, private contrition” had been practiced in early monastic communities in Ireland, Scotland and Wales. Making “auricular” confession once a year was set forth by the Fourth Lateran Council of 1215. A whole clerical class of “specialist confessors” sprang up, obsessed with the examination of conscience, ripe for inquisitional manipulation. Sexual abuses around confession helped galvanize the Protestant Reformation; in response, the “little black box” became a familiar item of church furniture in Milan’s Duomo in 1576, prompting a dangerous shift from the “public or social nature of sin to the scrupulous examination of recollected motivation.” Sexual solicitation, of both men and women, during confession was not uncommon, especially as clergymen were trained to be isolated, regimented and repressed (Cornwell enlists as evidence his own seminarian training in England in the 1960s). Yet it wasn’t until children were included as penitents, as part of Pius X’s staving off the ills of secular modernism, that the most egregious abuses were indulged and tolerated. Enlisting a legion of voices attesting to their “soul murder” by confessional priests, Cornwell offers another strong indictment of the church.